Making real people come alive to readers must be the Holy Grail of those who write historical fiction. If this is so, then our Founding Fathers, Washington, Adams, Jefferson and Madison are drinking from it right now in salute to Andrea Wulf’s success in weaving the origins of the United States with their horticultural interests. 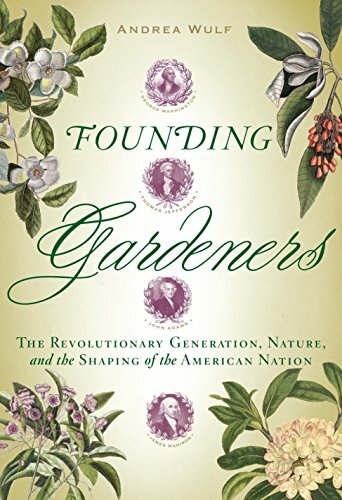 If you are any kind of gardener you should find Founding Gardeners: The Revolutionary Generation, Nature, and the Shaping of The American Nation an amazing read. Who knew these guys were just like you and me: gardeners? What a fascinating bit of research. And as a result, the Founding Fathers really do come alive. We study American history throughout at least 12 years of schooling, and most of us have the same stiff, myth-driven perception of those who founded the country. Andrea Wulf, however, takes a whole different view of the four who set the course of the United States. Using their own words, she weaves together the familiar history we all know (their strong desire to see the new country develop properly, free of England and its customs) with what is going on in gardens. These guys are really just farmers, gardeners at heart, and nothing more. They express their deep belief in freedom through the way they garden much the same way they do in their writings. It is their life long and passionate interest in gardening that really does make these men come alive. Instantly they become much more understandable, no longer mythological figures. They have an interest exactly the same as today’s gardener. Its is remarkable how reading their own words, aided the deft connections and historical context provided by Wulf,, adds so much to our understanding of them. How funny that Thomas Jefferson, for example, can skip away from in Paris to join John Adams, who is getting nowhere with the English in establishing relations and a suitable treaty. Jefferson convinces Adams to tour the English countryside, visiting famous gardens and nurseries. Jefferson shows himself to be one of those friends whose judgment you need to question at times as he convinces Adams to abandon a critical mission to visit gardens, and no doubt eat a good meal and have a drink or two. U.S history in a whole new light! Lots of what they saw in England was vast expanses of replanted, American landscape. John Bartram’s collection boxes were distributed throughout England and the plants thriving there. How they reacted to what they saw on this trip was a constant touchstone between the two. The friendships and fights between these men obviously had a clear horticultural connection. They sent each other books, seeds, nuts and advice. Adams was a manure man. Jefferson pointed his landscape vista west instead of towards England. Washington was a tree nut. Madison was upset about soil erosion and agricultural practices that wore out the soil. It is all new and interesting history. It is fascinating to know what was going on while these men were making speeches, writing constitutions, negotiating treaties and creating a new country. My favorite story, and there are many, is how gardening probably saved the Constitutional Convention. An impasse over how to count slaves in the census leads to a recess, which leads to some drinking in a popular pub. A casual remark about a visit to John Bartram’s nursery, the source of most of the seed s tock from America, resulted in quite a number of the delegates on both sides of the slavery issue, traveling out to the nursery and spending the day wandering around, looking at the best of the splendor of the American continent. It was probably during this visit that a compromise was set upon and the rest is history. Fascinating history that not only gives depth to the men involved, but color to the surroundings of the dry history of the Constitutional Convention that we have all studied. Ms. Wulf, who also wrote The Brother Gardeners: Botany, Empire, and the Birth of an Obsession, a study of the friendship between plant explorer John Bartram and Peter Collinson, has done her homework. Yours would have been more fun to do during high school if this history of gardeners had been included. It’s a great read for any gardener who also likes to take a nice romp through bit of history. Jeff Lowenfels is America’s longest running garden columnist. He is author of Timber Press’ bestselling, Teaming With Microbes: The Organic Gardener’s Guide to the Soil Food Web.